a. Licensed ministers in the Church of the United Brethren in Christ, USA, who meet the criteria set forth in the Discipline. b. Laypersons chosen by the congregations in which they are members, according to a formula provided in the Discipline. 2. The national conference is to be held every two years. All officials elected by the national conference shall be members ex officio of the national conference, the bishops to be considered presiding officers. 1. The national conference shall elect one or more bishops from among the elders throughout the church who have stood six years in that capacity. 2. The national conference has authority to participate in an international United Brethren church structure, and to edit Constitutional language to reflect the same. 3. No rule or ordinance shall at any time be passed to change or do away with the Confession of Faith as it now stands. 4. There shall no rule be adopted that will infringe upon the rights of any as it relates to the mode of baptism, the sacrament of the Lord’s Supper, or the washing of feet. 5. There shall be no connection with secret combinations, nor shall involuntary servitude be tolerated in any way. 6. The right of appeal shall be inviolate. The right, title, interest, and claim of any property, whether consisting in lots of ground, buildings and other improvements, legacies, bequests, or donations of any kind, obtained by purchase or otherwise, by any person or persons, for the use and benefit of the local Church of the United Brethren in Christ, USA, is hereby fully recognized and held to be the property of the local church. 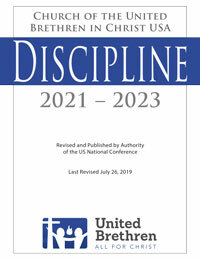 The right, title, interest, and claim of any US National Conference property, including legacies, bequests, or donations of any kind, obtained by purchase or otherwise, by any person or persons, for the use and benefit of the US National Conference of the United Brethren in Christ, is hereby fully recognized and held to be the property of the US National Conference, Church of the United Brethren in Christ, USA. 1. A referendum stating the proposed change will be placed before all members of US National Conference churches. If a majority of the members voting approve the referendum, it will be passed along for consideration by the next meeting of the US National Conference. 2. A two-thirds vote of the US National Conference is required to make the amendment official. The Constitution was originally adopted in 1841. It remained unchanged until 1957. Since then, about a dozen amendments have been made.